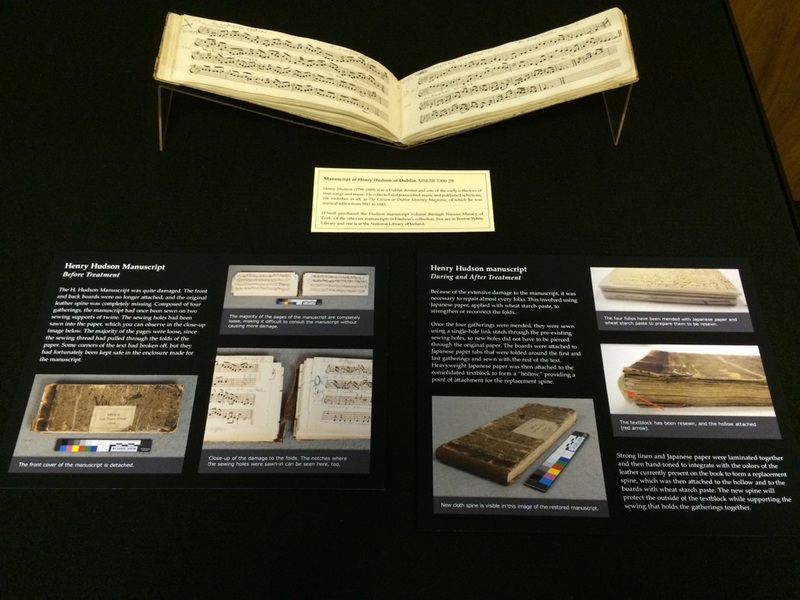 Digital Projects, Digital Humanities and Digital Exhibits. 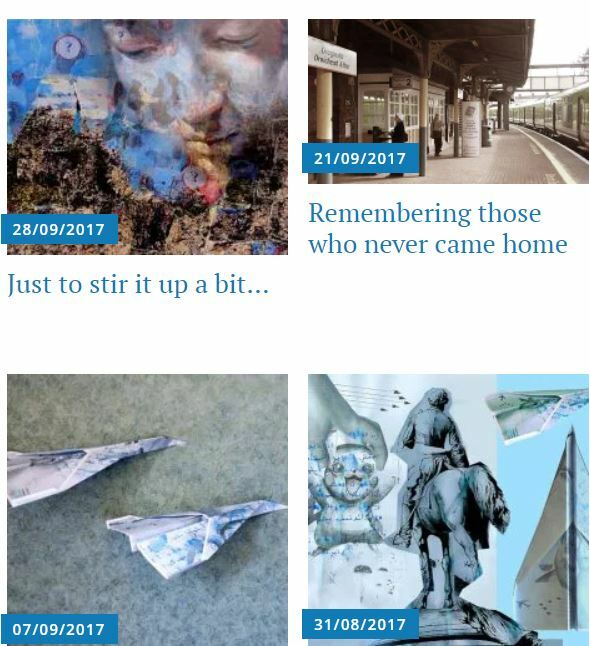 A digital project can be as simple as a collection of texts scanned and assembled on a website or as sophisticated as a collection where digital technology is used to examine and manipulate text, images, maps, video and data. Having received a number of inquiries on this subject, I compiled this list, a selection of digital humanities projects and digital exhibits. I haven’t attempted to describe or categorize them — that will be a future list! 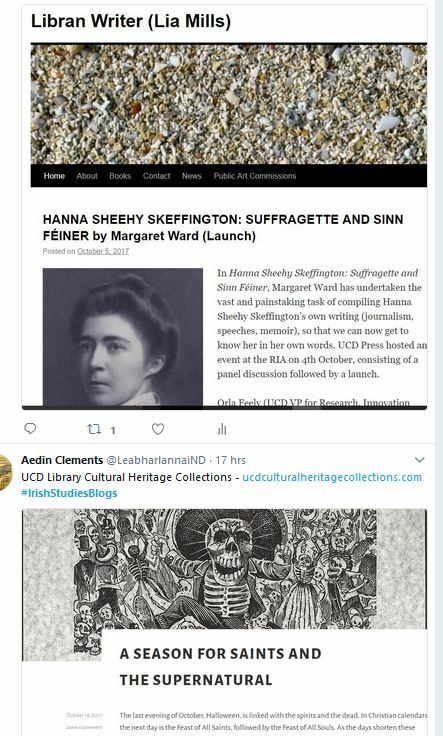 There are many large databases on the web: ongoing bibliographical and indexing projects such as ‘Irish History Online’, and large text repositories such as CELT. These will be listed in a separate blog post, and they are routinely listed in library research guides. This list focuses on smaller digital projects and on digital exhibits. The illustration above, Women of 1916, is part of an unfinished digital exhibit based on the 2016 Hesburgh Special Collections exhibit, Easter 1916: The Irish Rebellion. This points to the fact that not only are there many substantive exhibitions in libraries, archives and museums throughout the world, but the digital exhibits, which range from a series of photographs and information cards to a searchable database with text, photographs and even more sophisticated digital features, are not very easy to discover. Classic Irish Plays – A curated collection of digital scripts of plays by Irish playwrights. Collection of Irish Airs, Marches and Dance Tunes…by F. Roche, Vol. I, 101-199 (Interactive Scores) – ITMA, the Irish Traditional Music Archive. Contemporary Irish Writing – This platform currently hosts two projects: Joyce Today and 50 Irish Books. The Dublin Music Trade. 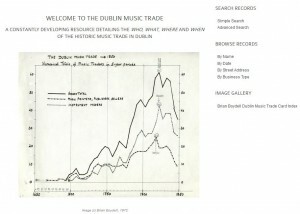 Database of the music business in Dublin up to 1850. The Dunn Family Collection: Francis O’Neill Cylinders. Earlier Latin Manuscripts: Tools for studying the scripts of the oldest Latin manuscripts – A database of manuscripts written in Latin before the year 800. Irish Famine Archive – A curated collection of digitized documents containing eyewitness accounts of the Irish famine migration to Canada in 1847-1848.
Letters of 1916 – A crowd-sourced digital collection of letters written around the time of the Easter Rising. Murals of Northern Ireland – A selection of digital images from the collection of Tony Crowley at Claremont College. National Collection of Children’s Books – Database and catalogue of children’s books in Irish libraries. Playography Ireland – Irish Playography and Playography na Gaeilge (Irish Theatre Institute). Saint Patrick’s Confessio Hypertext Stack (Royal Irish Academy). Séamus Connolly Collection of Irish Music (Boston College). 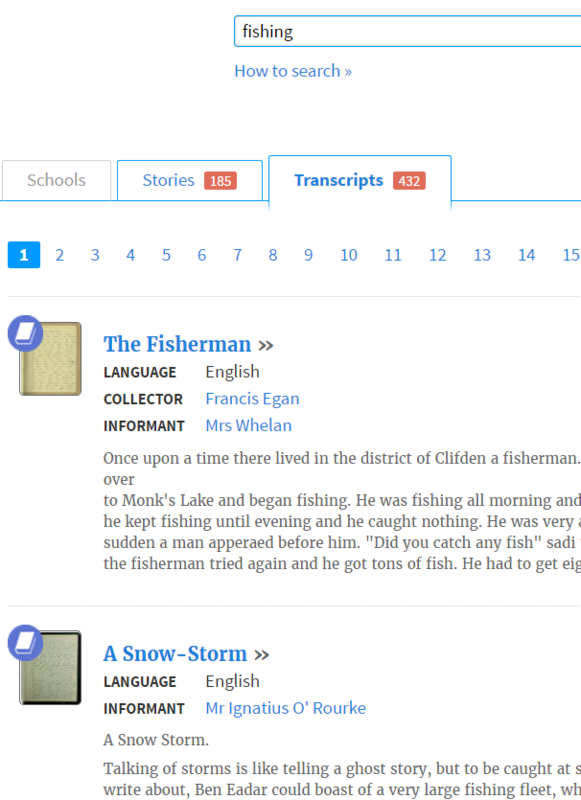 Translation in 19th-Century Ireland – A database of translators and works of translation from nineteenth-century Ireland. 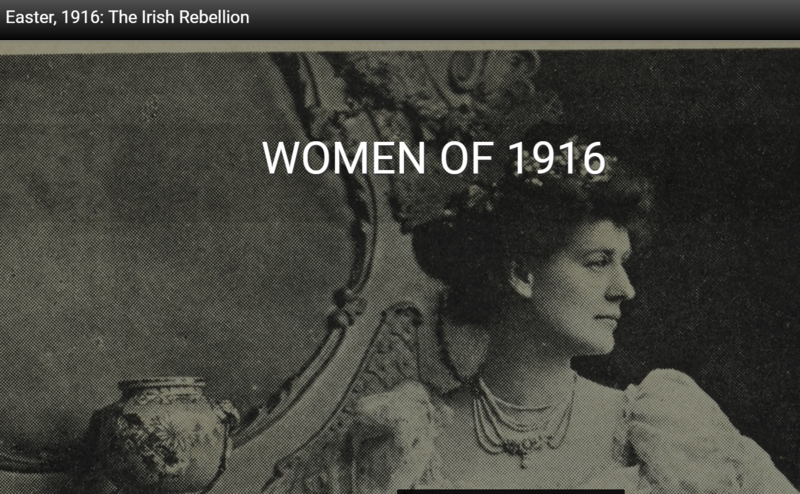 1916: Weaving Public and Private Narratives. Art and Revolution: The Work of Ernie O’Malley. Frongoch and 1916: Recreating a Lost Landscape. A history of the Oireachtas Library. Ireland and the Great War. The Theft of the Irish Crown Jewels. 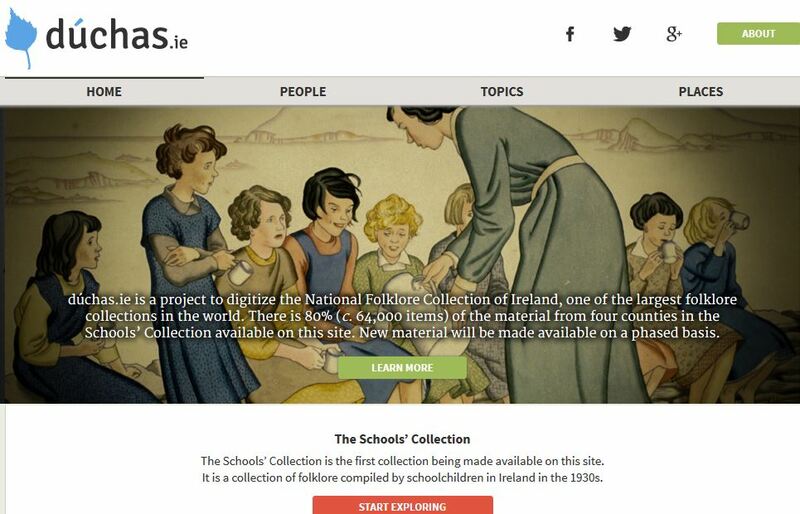 In addition to the Letters of 1916 project listed above, other projects which have used crowd-sourcing include Duchas.ie, the Schools Collection of the National Folklore Collection, and Irish Speakers & the Empire City. For further reading on digital humanities in Irish studies, see the Breac(2015) issue on digital humanities. We have not digitized anything in our Irish theatre collections. While we have a great collection of theatre programs and scripts, much of this is in copyright. But I have been watching with great interest the digital project of the plays of Dion Boucicault at the University of Southern Florida, and the potential it holds for scholars of Irish drama. The Dion Boucicault Collection at USF Libraries is one of the largest Boucicault collections in the world. Under Matt Knight’s careful stewardship, selected works are displayed and contextualized in a clear and easily-navigated website. The introduction explains that Dublin-born Boucicault was wary of publishing his plays for fear of piracy, and therefore few of his scripts exist in print. The collection website lists fourteen plays of which ten are currently available on the site. These include The Shaughraun and Robert Emmet. Selecting a play from the menu takes you to an introductory page with brief information on the play and its performance, and links to the digital items, in most cases a promptbook which can be viewed online or downloaded, and a transcript. The promptbook for Marriage, for example, is described in the catalog as “typed pages with extensive notes from the stenographer and minor notes from the author”. The Shaughraun section includes the most interesting content, with multiple promptbooks and photographs from various productions of the play. After exploring the website, I sought more information on USF’s collection and sure enough I found a library finding aid, or archival description, of the Dion Boucicault Theatre Collection 1843-1887. Here we learn that the collection was originally bequeathed by Dion Boucicault to his widow Louise Thorndyke, and was sold a couple of times before being acquired by USF. The collection consists of 27 boxes, and the finding aid provides a detailed list of contents. I wish the website had a link to the finding aid and a brief explanation of the scope of the collection, and that the finding aid likewise provided some indication of the digital project. That would be of great assistance to people who stumble on either one. I hope more collections will be digitized in a similar way, and and I expect to spend much time exploring this website as we learn to use our library’s digital exhibit facility. In 1931 Captain Francis O’Neill, one of the great collectors of Irish music, gave his library to the University of Notre Dame. O’Neill, born in County Cork in 1848, left Ireland in his teens and after some interesting years which included working as a sailor, settled into a career in the Chicago police force, becoming Chief of Police in 1901. Throughout his life his passion was Irish music, and he collected assiduously from Irish immigrants in the Chicago area. He also amassed a large collection of books on music and on Irish history, and these books, now in the Hesburgh Special Collections, show signs of his research in small pencil marks in the margins. Many Irish dance tunes might have been lost but for the collections that O’Neill published. His collections are among the most important sources of Irish dance music. In addition to the books, the Library received two manuscript books, each with an interesting provenance. The manuscripts were in poor condition, and have recently been taken to the Conservation Lab where conservator Sue Donovan stabilized bindings, carried out some mending and re-sewing, and returned them to the Rare Books Department in new custom-made cases. They have also been digitally scanned, and may be viewed by clicking on the links below. 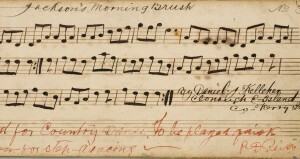 Manuscript of Patrick Reidy, Professor of Dance. The Dancing Master was popular in rural Ireland in the nineteenth century. Travelling dancing masters would stay some weeks in an area, and hold classes there. O’Neill devotes a chapter to the Dancing Master in his Irish Minstrels and Musicians (Chicago, 1913). London in the 1890s had a large Irish population, and had its own branch of the Gaelic League by 1897, and when this branch eventually engaged a professional teacher for dance classes, they found Patrick Reidy, or Professor Reidy, a well-known dancing master from Kerry, living in Hackney, London. It was Reidy who introduced and taught the group dances such as ‘The Siege of Ennis’ and ‘The Walls of Limerick’ which first became popular in London Gaelic League gatherings, then spread throughout England and into Ireland, through Gaelic League activities such as the 1901 Oireachtas in Dublin. Reidy was also one of the chief sources for the dances in A Handbook of Irish Dances (1902). This manuscript contains 37 pages of music, mostly dance tunes although there are some slow airs. A note on the source is often provided, with occasional additional comments such as that on the illustration above. Manuscript of Henry Hudson of Dublin. Henry Hudson (1798-1889) was a Dublin dentist and one of the early collectors of Irish songs and music. He collected and transcribed music and published selections, 106 melodies in all, in The Citizen or Dublin Monthly Magazine, of which he was musical editor from 1841 to 1843. 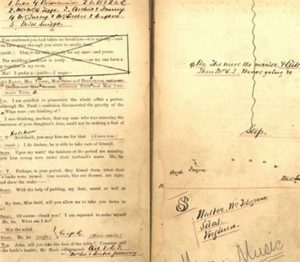 In a letter written to Charlotte Milligan Fox, dated July 28th, 1911, O’Neill explains that he purchased the Hudson manuscript volume through Nassau Massey of Cork. Of the other six manuscripts in Hudson’s collection, five are in Boston Public Library and one is in the National Library of Ireland. ‘Vol. 3 – H. Hudson’ is strongly penned on the outside of the cover. On the inside of the front cover, and continued along the fly-leaf, is an index commencing with No. 243 and ending with 370, followed by the signature, ‘H. Hudson, 24 Stephen’s Green.’ The little volume is oblong, 9 by 3¾ inches. Of the total number of tunes and airs –128—full fifty seem to have been taken from another numbered MSS. collection made by F. M. Bell, who credits them to Mrs. Foley, Margaret Foley, Mary Parker, and Margaret Kearney. Perhaps the most interesting notation in the volume is: ‘The Maid of Sweet Gurteen,’ taken down by W. E. Hudson from singing of a little girl, Trassan (?) Street, six o’clock p.m., 9th December, 1840; and ‘Erin’s Lovely Home,’ taken down by W. E. Hudson, Naas, 17th December, 1840. C. Milligan Fox “Concerning the William Elliott Hudson Collection of Irish Folk Songs” in the Journal of the Irish Folk Song Society, Vol. X (1912), pp. 5-9. The very first item presents a typical Breac problem for librarians. What is “Am I Rambling”? Is it a film? Is it street theatre? Is it a guided tour? I can tell that it is an experimental event, organized and presented by Veronica Dyas and Sorcha Kenny, in which a group of people walk around Dublin and encounter street art. At least that’s what I think it is. Beyond that, I am waiting to see commentary on the Breac site to help me interpret the video. Brian Ó Conchubhair describes Fíbín, an Irish language theatre group, once again using the medium of the online journal to provide a video. Other articles are more traditional scholarly articles, but they take advantage of the digital platform by providing hyperlinked references that take the reader straight to the article under discussion, if available online. Fíbín: Back to the Future? Main page of Dúchas website. While many features are under construction, we may view a list of places in counties Dublin, Donegal, Mayo and Waterford, select placenames and view the notebooks of collected folklore. I plan to spend hours of the Christmas break reading through these notebooks and looking for treasure. 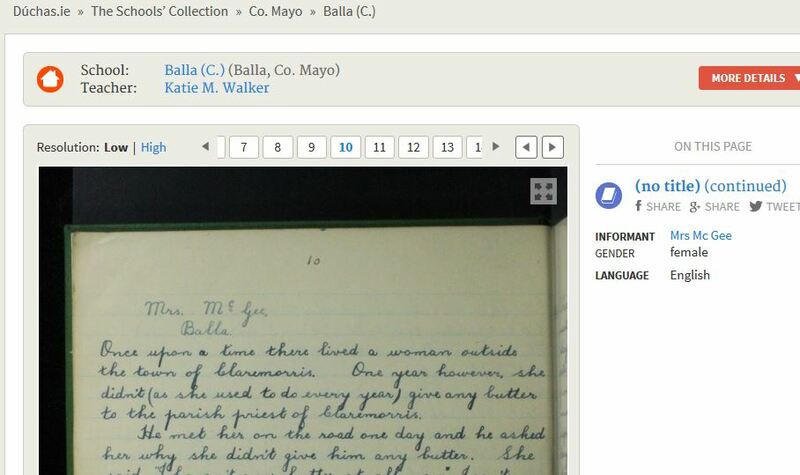 The informant is Mrs. McGee of Balla, and the teacher is Katie M. Walker, Balla, Co. Mayo. It is the story of a woman who became unable to produce any butter no matter how long she churned. The priest prayed as she was churning and eventually the butter thief turned up screaming outside the door. The story provides background for the custom where visitors to a house are expected to take a turn with the churn. 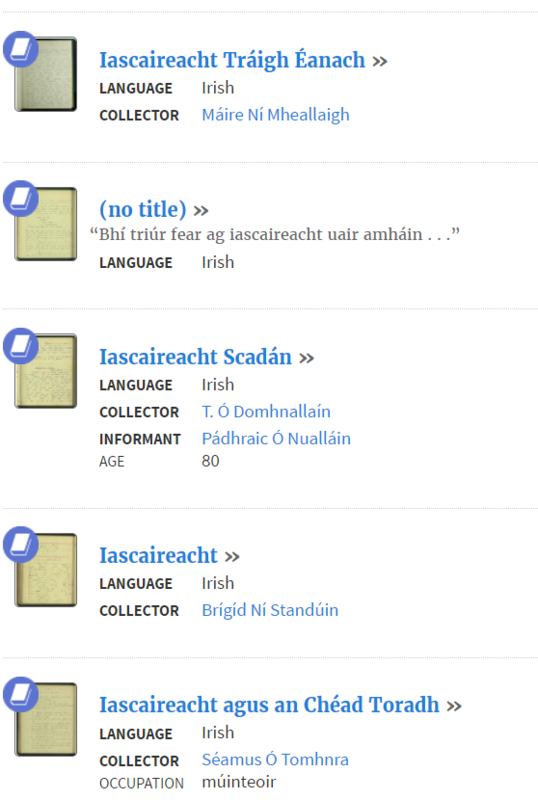 A number of the collections from Co. Donegal are in Irish. As most students today are not familiar with the script or spellings used in the early 20th century, they will need assistance. Perhaps some of the content will eventually be available in transcription and I wonder if that transcription would also change the spellings to the standardized spellings that we use today? The website provides the Archival Reference below each page image, and the name of both the collector, in this case the student, and the informant, normally an older person who shared a story or account with the student, are listed beside the page image. It would be helpful to have precise instructions on how to cite items from this collection as I expect students will want to use them for their essays. Information also on where to seek permission to use, especially for publication, material in the collection. I have no doubt that this information will be forthcoming. I will be very interested to hear how others use this collection and also comments you have on the website. 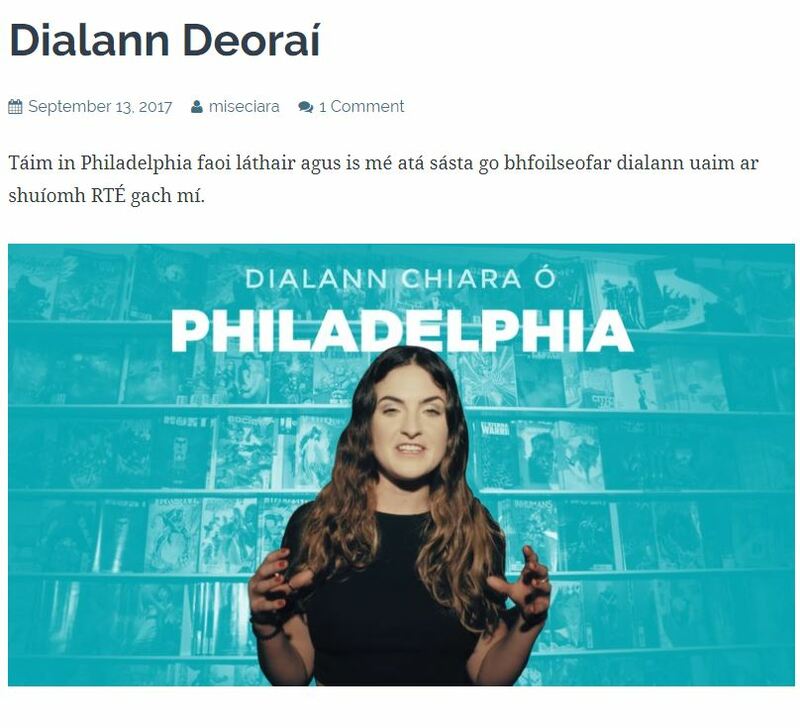 Gabhaim comhgháirdeas leis an bhfoireann a chuir an áis iontach seo ar fáil, agus beidh mé an-sásta é a thaispeáint do mhicléinn atá ag déanamh taighde sa bhéaloideas. That is to say, congratulations to the team who made this available! I’m experimenting with the Hathi Trust’s Digital Library to see how its list features might be used for teaching and research. Apparently it is possible to make a list and then do full text searching within that collection of digital texts. To see how it works, I’ve compiled a list of descriptions of Ireland. When I saw the search capability, I thought the results might all appear together, but it is still a multi-step process. When you perform a word search, you get a list of the books where that word appears, no indication of the frequency, and you then select each book in turn and hit the “find” key. However, the resulting information is a very nice little snippet that shows the word in context. A search for “criminal” brought up a list of books; this is the result for John Carr’s A Stranger in Ireland (1806). I think this will be a very useful tool though it would have been nice if all the “criminal” snippets from all the books in the collection were displayed together. The Dictionary of Irish Biography: This is available to the Notre Dame community through the library’s catalog. If the link doesn’t work, go to the Library’s website, select the Databases tab, and find the Dictionary. In addition to searching for people by name, you can search by place, dates, occupation and even by free text which means you can find any words occuring in the text. For example “Hunger strike”, “slavery”, “philanthropy” all yield lists of names. Biographies are added all the time and at this point new additions include people who died in 2005 and 2006. Oxford Dictionary of National Biography: Also a subscription, this has been around far longer than the Irish one, and includes many biographies of Irish people. It is “the national record of men and women who have shaped British history” so while there is no entry under “Haughey”, for example, Irish people from earlier centuries such as Aogán Ó Rathaille, or born in Northern Ireland, such as Siobhán McKenna, or whose career was largely in the UK, are included. There are also websites freely available to all. 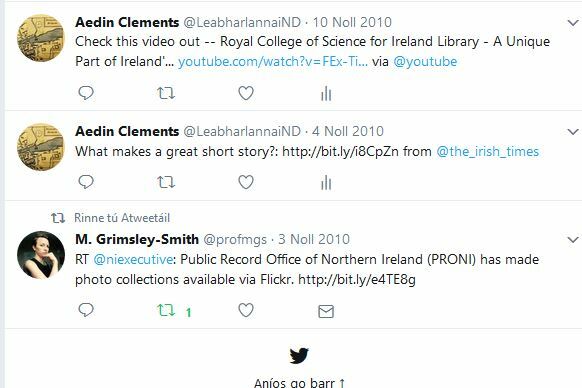 Those I know about and use frequently are Ainm.ie, Ricorso.net and the Dictionary of Ulster Biography. All kinds of people associated with the Irish language are included in Ainm.ie, the digital version of the multi-volume Beatháisnéis. Ricorso is mainly a bibliographic database but includes a short biographic summary of each Irish writer. Biographies from the whole province of Ulster are included in the Dictionary of Ulster Biography. As far as I know, Ricorso is the only one of all the sources I mentioned that includes people who are still living. It is worth remembering also that writers in this database are not only literary authors but people who have written on many subjects.